It is well-known to the historians of religions that the veneration of stone is universally widespread and exists in most religions. Sacred stones or rocks are also present in Islam, the best example being that of the black stone of Mecca — the remnant of an ancient Arabic cult of monoliths (Bethyl) replaced and reinterpreted by Islam — or of the Dome of the Rock at Jerusalem.’ Besides, the veneration of stones was maintained as semi-independent cults in some trends of Turkic Islam under the influence of several surviving pre-Islamic ideas (animistic and shamanic). Also, we know magic, curative, and rain stones, the laffer being a very ancient magie artefact among both the Islamic and non-Islamic Turkic peoples in all of northern Asia. Particularly interesting is the case of a stone called pálhang by the antinomian Qalandars, the members of guilds and the spiritual chivalry (Futuwwa), and of the “stone of the surrender” (teslim tas) by the Turkish Bektashis. Although the pálhang and the teslim tas are both present in the Bektashi sources at least since the beginning of 19th century, we know from history that the pálhang has preceded the teslim tas and that this pálhang was one of the major paraphernalia of the Ottoman, Persian, and Central Asian Qalandar der-vishes. We do know, however, that there are some discrepancies between the function and the shape of these two stones, both in history and at present times. It is known from several Eastern and Western written as well as visual sources that the tradition to wear stones at the girdle or on a belt was widespread among the Qalandars. (Qalandar. Qalandars are wandering ascetic Sufi dervishes who may or may not be connected to a specific tariqat. They are most prevalent in Central Asia, India and Pakistan, in the latter “qalandar” is also used as a title. Some famous Qalandars include Lal Shahbaz Qalandar and Bu Ali Shah Qalandar. In addition, among the Ottomans, the omamental carved stone fixed to beits by the Qalandars received a symbolic and sacred virtue and was named after this belt. This is the first mention of the secrecy concerning this stone, but without any explanation. This point is confirmed by the same traveller when he meets another Qalandar who also tells him that the meaning of the stone is a “great mystery”. ( Nau’s conclusion is that the Qalandars didn’t want to reveal the symbolic virtue of the stone to a non-Muslim, as this is a secret to all people who are not Qalandars). The treasure of the separation from everything is the lock of the pálhang and the belt. Thanks to the traveller Evliya Qelebi who met Qalandar, Bektashi, and Abdal dervishes in 17th-century Anatolia, we know some complementary details about the utilisation and the symbolic meaning of this stone. The Bektashi dervishes Evliya Qelebi met at the convent (lekke) of Seyyid Battal Gazi (one of the most ancient and reputed ones in Anatolia, near Eskisehir), wore the pálhang in combination with several other Sufi paraphernalia like the begging bowl (kenkul), the stick (`asa), the ax (teber), the horn (nefir), etc. The pálhang was sometimes set with jewels and then called palheng-murassa. 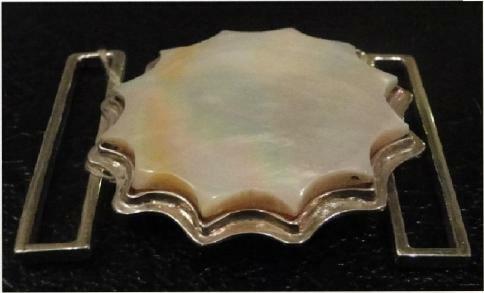 Mention was also made of a belt ornate with several balgami (alabaster) stones. As shown above in Siri’ s poetry, the pálhang is a symbol of renunciation and the ascetic path. This view is confirmed by Evliya Qelebi who reports the following words that probably stem from a Sufi catechism: “wearing the palheng, pressing it on the waist and fighting his ego means that I am hard-hearted“. A very similar observation about the Qalandars is found in Rycaud’s travelogue one century later: “although their path is ascetic”, writes the traveller, many Qalandars “consume their time with eating and drinking”, and one characteristic of the pálhang was to help them support these faults: “in order to maintain this gluttony, they will fell the stones of their Girdles, their Earings and Bracelets“.’ This ascetic function of the pálhang was maintained over time until the end of 19th and the beginning of the 20th century. All these interpretations of the pálhang- and especially the idea that tying a stone to the belt can permit the suppression of hunger – are inspired by several Hadiths. According to one of them, Talba’s father and his friends complained to the Prophet Muhammad about their hunger. Then, they each fastened a stone onto their stomachs, and Muhammad fastened two onto his.” Thus, the Prophet of Islam appears here as a determined and exceptional ascetic. This tradition was well-known in Ottoman literary circles and even inspired a proverb: “for hunger, he has bound the stone against his navel“. “What, is it they who divide the mercy of the Lord? We have divided between them their livelihood in the present life, and raised some of them above others in rank, that some of them may take others in servitude; and the mercy of thy Lord is better than that they amass” (translation by A.J. Arberry). Among the Bektashi, the pálhang with twelve sides is also a symbol of the famous formula “eline, diline belime sahip ol (“to control one’s hand, one’s tongue and one’s loins/sperm“) that is one of the major ethical and ascetic mies of this lineage. In Persian Sufism, the pálhang reflects the same values as in the Ottoman Empire, but with a stronger influence by the Futuwwa; the lone difference is that it is a rope (instead of a stone) that is composed of seven knots, each symbolising a quality of the ascetic path, such as generosity, contentment, patience, privation, etc. Other Persian treatises still focus on the same qualities, for instante: “My pálhang is patience” . In the Kháksár Sufi order, the sacred stone named “stone of contentment” (sang-i qana’at) is very similar to the pálhang stone, probably because the Kháksárs have borrowed many ideas and symbols from the Qalandars. The sang-i qaná at is depicted as a nice and coloured stone generally fixed to a big bundle or sometimes tied across the stomach behind the belt. It is also linked to the ascetic tradition according to which a heavy stone placed upon the stomach may diminish the pains of hunger. The sang-i qaná at is obviously an offshoot of the Qalandar palhang. 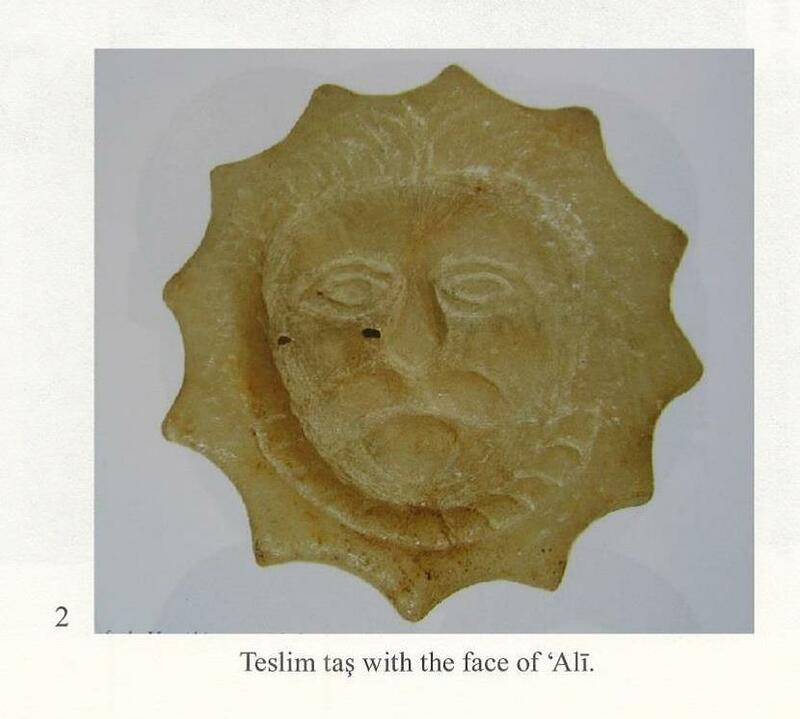 It is also known that in the beginning of 20″ century, some Central Asian Qalandars have also called the stone attached at their belt sang-i gana’at.24 This name was furthermore given by the Bektashis to their own stone called teslim tas (see below). In Central Asia and in Xinjiang, up to the middle of the 20n century, the Qalandars used to bind a large stone to their stomach. There are some photographs which show that this stone was either a square or a circular or octagonal and flat stone, both with a decoration in the middle. 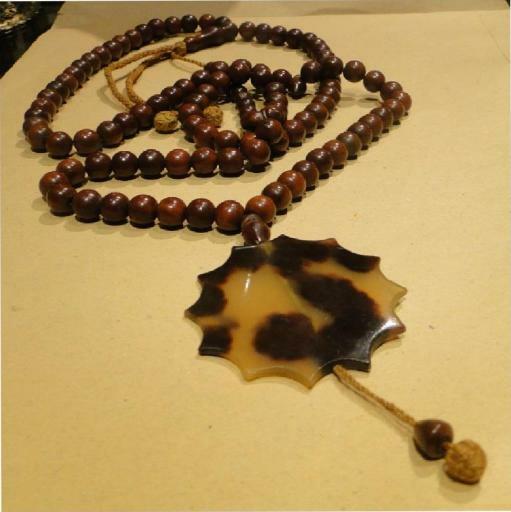 In Xinjiang, the stone is round and usually made from jade that is precious in the region. All these Qalandars resemble those represented in paintings and miniatures of the 16′ and 17″ centuries. Several sources report that in Futuwwa, Qalandariyya, and Bektashism, the pàlhang, whether a stone or a belt, was transmitted through a ritual of girding the waist. One of the oldest mentions of the pálhang in Anatolia is found in the poetry of the Anatolian dervish Yunus Emre (who lived in the 13th century), though many of his poems were imitations composed by subsequent Sufi poets. It appears that the pálhang is linked to a Sufi ritual of girding; and it reminds us of the belt girding of the Futuwwa which was the initiation ceremony to enter this trend. Come with love and be girded with the pálhang of dervishism. 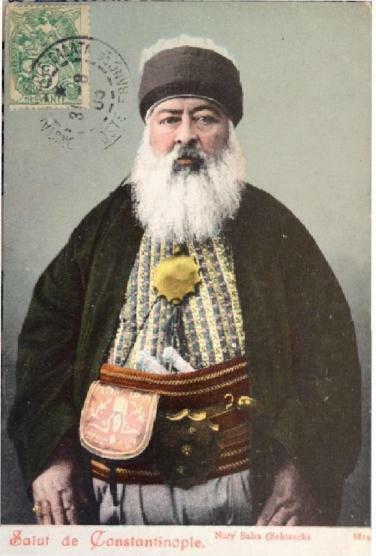 In the 19″‘ century, Yahya Agah Efendi reports that the transmission of the palheng-i tarikat (stone of the Sufi path) or bel tokaszi (buckle of the waist) was very similar to the ceremony of girding in the Futuwwa. 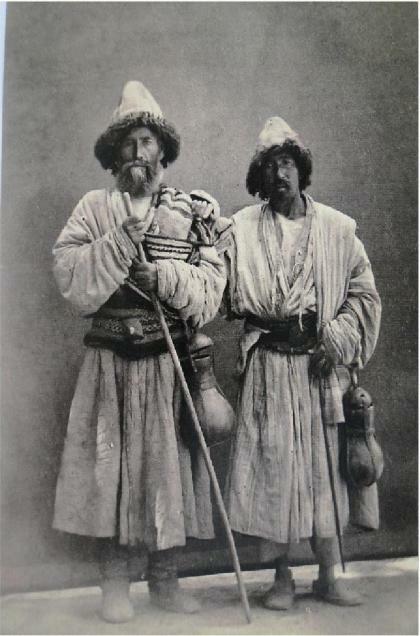 Photograph of two Qalandar dervishes with stones Drawing of Kazak Abdalon their belts. In Bektashism in general, this ritual is accompanied by the reading of some sura of the Quran with particular prayers; all of them reveal to the initiate the meaning of the symbols embodied by the sacred stone. The first sura is supposed to remind the ethical and ascetic virtue of patience that is attributed to the pálhang: “Oh believers, be patient, and vie you in patience; be steadfast; fear God; haply so you will prosper” (Quran 3:200). “It is God who created seven heavens, and of earth their like, between them the Command descending, that you may know that God is powerful over everything and that God encompasses everything in knowledge” (65:12). The fact that in Bektashism, the new initiate is usually girded with a particular woollen belt — called “sword-belt“( Tig bent)which in this Sufi order is the equivalent, of the initiatory belt of the Futuwwa — produces some confusion with the pálhang which is also supposed to be girded around the initiate’s waist. Perhaps this is the explanation for why in the end, the pálhang, originally a belt with a stone, only means a stone. Worth noting is that in some Persian texts of the Persian Kháksár order, the figh, a sword, and the sang, a stone, are usually associated. There are no explanations in the sources for the number of sides of the pálhang: usually six or seven and more frequently eight. Six sides may be a hint at the Solomon seal, and seven is a figure quite popular in the Muslim tradition, so it does not need any explanation. The figure eight generally refers to ‘Ali ibn Mása or Riza, the eighth Imam of Shiism who is respected both in the Futuwwa and in Bektashism. Pictured by Vá`ig al-Káshifi (d. 1504-1505), the writer of a treatise on the Futuwwa as the “honourable sultan of Khurasan”, this imam is also considered to be the teacher of the etiquette of the Futuwwa that was so influential on the Qalandariyya. Furthermore, according to the Velayemame (the major Bektashi hagiography), the sacred artefacts (clock, headgear, candle, etc.) of the Sufi path were transmitted by the eighth Imam to Ahmad YasavI who then forwarded them to Haji Bektash, eponym of the Bektashi order. Besides, as indicated in the Veláyetname, the cupola (kubbe) of Haji Bektash’s mausoleum is composed of eight arches (terek) for the love of the eighth Imam. It is worthy to finally mention that in some cases, the pálhang has divinatory and curative properties. Covel, for instance, mentions that thanks to this stone, Qalandars were able to foretell the sickness of any people and that the stone is also a protection against poison.36 We must think here about a possible link between the pálhang and the famous “rain-stone” (yada stone) in the Turkic tradition, as well as other magie stones in Anatolia. But this is another story. There is a stone named teslim tas in the Bektashi order of dervishes, a Sufi lineage strongly influenced by the Qalandariyya which originates partly in the pálhang although it is different from it. I do not intend to develop in detail the case of this stone here, but just to point to some of its major aspects, first and foremost its polysemic quality. As mentioned above, when fixed to the girdle of a dervish or tied across his stomach, the eight- or seven-sided sacred stone of the Qalandars is called palheng tas. 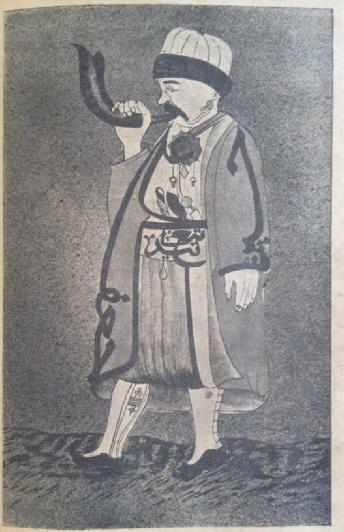 If it is smaller, with usually twelve (sometimes eight or seven) sides and worn by a Bektashi dervish on his neck, close to the heart, it is called teslim tas (Plate 12.2). The teslim tas or “stone of submission” is also, though rarely, named kanaat tas, “stone of contentment”, and even nowadays, in the Eastern Rhodope Mountains (Bulgaria), cetvel or karatas (black stone), though the second term is usually used for the pálhang.” The teslim tas” generally has twelve sides in Anatolia — in reference to the twelve imams —, but only seven sides in the Balkans (Bulgaria) — due to an excessive veneration of the seventh Imam — and only rarely six or eight sides, contrary to the pálhang. Its diameter is approximately 10 cm, and it is about 1.5 cm thick. It has a hole from its top to the bottom through which a string is introduced; from the top of the stone, this string is thin and reaches around the neck of the dervish; at the bottom of the stone, the string is thick and ends in some big circular knots (Plates 13.1, 13.2). A teslim tas (drawing with details). Outer face: Muhammad; Khadija; zabir. Inner face: ‘Ali; Fatima; batin. The stone itself is either made from a kind of alabaster (balgami), quarried near the city of Kirsehir near the village of Hacibektas in Central Anatolia, or from a crystal called necefi tas (stone of Necef), supposedly coming from Najaf in Iraq where the mausoleum of Imam ‘Ali is situated. It is also worth mentioning that the balgami stone is also called Bahm tas, from the name of Bahm Sultan (16th century), the second master of the Bektashism who is supposed to have miraculously created this stone. The teslim tas is also made from onyx and particularly from carnelianiagate (akik), a semi-precious stone enjoying particular favour among the Shiites. Its colour is yellow, white, or beige, with red or brown veins and stains. 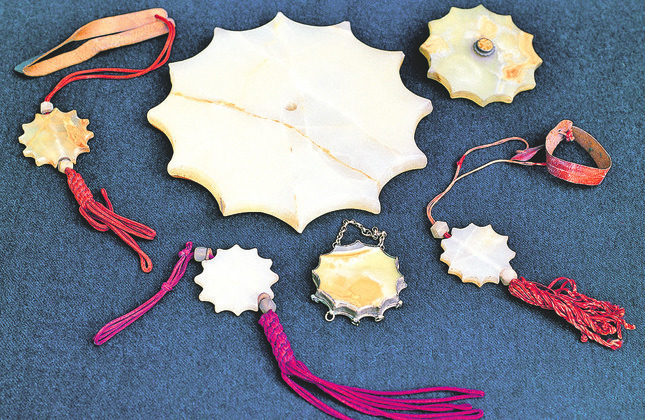 Due to its popularity and symbolic virtue, the teslim tas is not only worn as a sacred paraphemalia suspended from the neck or as earrings by the high-ranking Bektashis, but also — as both an object and an image — drawn and carved everywhere in the Bektashi lodge for ritual purposes or for decoration. It is especially present in the architecture, for example at the top of the main gates of the Bektashi lodges, on their fountains and walls, on the grave stones of the Bektashi dervishes, etc. (Plate 14.1)’ It is also drawn in Bektashi calligraphies and on manuscripts in composition with other symbols (Plate 14.2), as well as some objects of day-to-day life, like tea or coffee cups, plates (Plate 15.1); jewellery and medals are also made in the form of this stone. It is also worth noting that the stone is quite venerated by the members of other Turkish Sufi orders, especially by Rifái and Halveti-Misriye.’ It is known, for instance, that several Rifái medals and calligraphies mingle the teslim tas with their own symbols. The stone has finally become a talisman (tidsim), printed on paper or cloth, a phenomenon that has extended its influence beyond the Sufi milieu to the whole of the Turkish society. 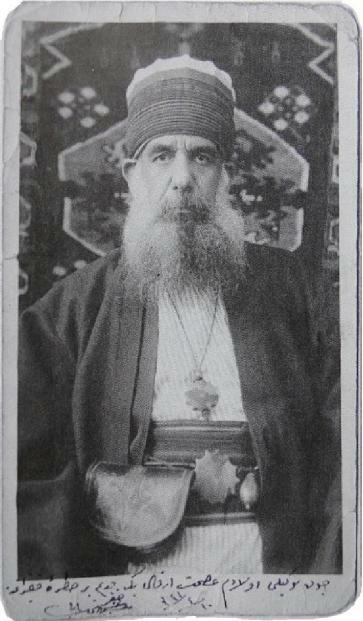 As far as I know, there is almost no mention of the teslim tas in historical sources prior to the 18th century, neither in the hagiography of Haji Bektash dating from the l6th century nor in the other hagiographies of the same period dedicated to Bektashis saints. The love Bektashi paraphemalia dedicated to the figure twelve is the headgear which was adopted with many Shii ideas from the Kizilbas and the Safavid states. In the first half of 16th century, for example, the Sufi writer Vahidi wrote that the Bektashi wear twelve-gored conical caps of white felt ornamented with a button made of “Seyyid Ghazi stone” at the top. We have no more details about this “Seyyid Gházi stone” which obviously refers to the famous figure of Seyyid Battal Ghazi, an Arab warrior who had fought the Byzantine Empire in the 8th century and was therefore regarded as a prestigious Bektashi saint. But Vahidï didn’t mention any twelve-sided stone. The practice of carving a teslim tas into the Bektashi grave stone in the cemeteries of the lodges of the order and elsewhere seems to appear at the end of the 18th century. The twelve-sided stone is suspended with a collar to the upper part of the grave and constituted by the headgear of the deceased dervish — a sign that it is not a pálhang. The oldest grave stones with such a decoration stem from 1775, although in a small number. Therefore, this decoration became the rule in the second part of the 19th century. 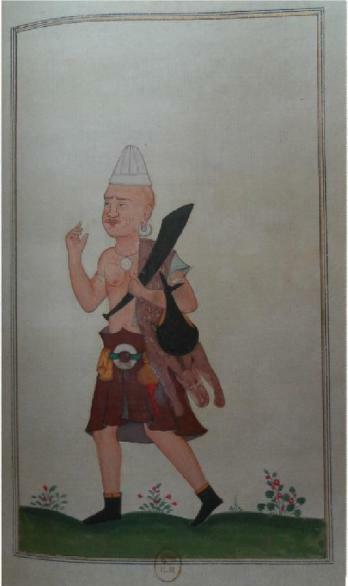 However, an exceptional miniature exists from the end of the 17th century, representing a dervish depicted as a Bektashi (probably a wandering Qalandar), with almost all the well-known Sufi paraphernalia and, among those, both a pálhang at his waist and a teslim tas with eight comers suspended from his neck.’ This image is unique for this early period in terms of wearing the two stones. 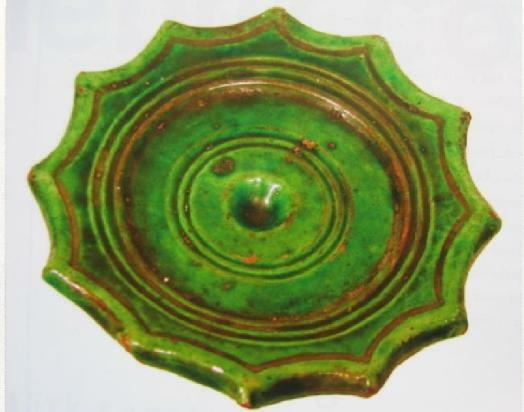 In the early 19th century, according to a European traveller who visited Greece, “the Bektashli are so called from a Cappadocian sheikh who wore a stone upon his navel; in memory of which his followers wear a stone which is green and of this form [ineluded is a drawing of a stone with seven sides] suspended to the neck, and hanging upon the naked breast…”.” Here, the teslim tas has seven sides, as is usually the case in the Balkans (contrary to Anatolia, with twelve sides) (Plates 16.2, 17.1). The teslim tas is a quite complex polysemic symbol; it actually has a wide symbolic spectrum, which hints to Shii, Ismáili, and Sufi myths and teachings. From its name, it is clear that the teslim tas incamates the resignation and submission to God as well as the fidelity to the Bektashi path. the symbolisation of the Bektashi path: Sufi teaching and initiatory death. 3) that he had disobeyed the sharia. Myth A: According to Agah Efendi (1904), the “secret” of the teslim tas is the following: “In order to test the Prophet Moses, God asked him to bring the worst creature among those he had created. Then Moses tied a dog with scabies with a cord and brought it to God. But this dog talked with a human voice and said: ‘Oh Prophet of God! From whom have you heard that I am the lower creature of God?’ Moses felt ashamed and repented of having thought so. He said: ‘Oh Master, I am guilty, I ask pardon of God” — and expressed his humility (aciziyet) with a stone suspended from his neck. Myth B: We are told by Evliya Celebi that one day, the Holy Wisdom noticed that Moses had left his blessed cloak (hirka) on a stone (tas) and was naked, taking a bath in the Nile river. With the order of God, the stone started to move towards Egypt. Moses took a stick ( ascá) and set off in pursuit of the stone. Finally, he reached the stone and beat it with his stick twelve times, making twelve holes. When Moses learned that the stone was obeying the order of God, he begged it to be forgiven. The stone forgave him but told Moses to suspend it from his neck through one of the holes; so the stone would be with him in case he needed help. Moses did so, and nowadays, among the dervishes, the balgami stone suspended from their necks is called sekel. This is also the reason why a sekel [sekil], a “stone seat”, is nowadays suspended from the neck of those who disobey the sharï a. 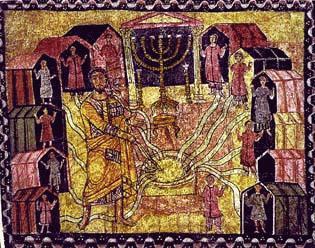 Later, when he visited the desert of Tih at the font of Mount Sinaï, Moses knocked the stone twelve times and thus created twelve springs flowing from each of its twelve holes. This myth is quite old since it was mentioned in a treatise of the Futuwwa, in the 15th century, by Seyyid Huiseyin b. Seyyid Gayb. There is another myth we could call the “spittle of Haji Bektash“, that is a mix of unidentified legends with Shia ideas. According to this myth — of which there are several versions Haji Bektash (or Bahm Sultan, in other versions) was poisoned by a man who had given him hospitality; but the saint immediately spat blood which hardened into a stone called teslim tas. The red veins that appear on the stone are considered to be these traces of blood. This narrative was clearly inspired by the legendary life of Imam Hasan, son of ‘Ali, who had been poisoned by his wife Ja’da at the instigation of Mu’Awiya.” Another version of this myth brings in more details: the man who poisoned Haji Bektash was a Turk, i.e. a Muslim, and it was from a Christian that the saint obtained an emetic that caused him to spit blood: “his spittle mixed with his blood hardened into the red-veined variety of the local agate”, a stone found near the village of Hacibektas, the centre of the Bektashi order. The teslim tas is also known as balgami tas (mucus or phlegm stone) from the element that composed the vomit of the saint. A very similar legend exists in the oral tradition of the Qalandars of Pakistan. According to them, the petrified vomit of Imam Hasan, poisoned by his wife, was used to make stone amulets (ta `wizz), depicted as “poison stone” (zahr-muhrah) that can protect someone from any poison. 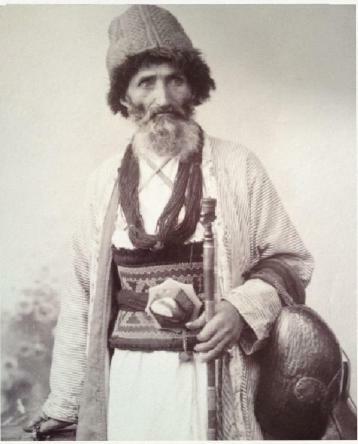 In another version of this legend, Haji Bektash, visiting the village of Ermeni, was granted hospitality by peasants who offered him a meal of curdled milk and honey. The saint then spat out a mouthful of the food which at once hardend into stone, and he told the peasants that the descendants of their descendants would never suffer from hunger. According to another version of this legend — collected in 1995 by Lyubomir Mikov in the Bulgarian Rhodope Mountains Haji Bektash, poisoned by the inhabitants of a village, vomited the bad food onto a stone which took the shape of the teslim tas. However, the stone became black and tar-like because of the strength of the poison; this is the origin of another name for this stone in use in the Balkans: “black stone” (karatas). Meanwhile, several beliefs mingled with the Anatolian legends, and the teslim tas was regarded as a stone composed of the sacred soil of Karbala (turáb) as well as of the blood of Husayn, the son of Imam ‘Ali who had been killed there. In the eyes of the believer, this blood is a reminder of the imam’s martyrdom. The geometrical shape of the teslim tas — both of the stone itself and of the string and the big knots at its end — bears numerical values (12, 8, 7, etc.) which hint at the most sacred figures of Shia tradition. First and foremost, the twelve sides of the stone rep-resent the twelve imams of Shiism. However, if there are only seven sides, they refer to the Seventh Imam, i.e. to the Ismálli faith; and if there are eight sides, as explained below, they pinpoint to Imam Riza. Furthermore, in the upper and lower sides of the stone, near the hole used for the string, there are two little circles called habbe (grain, seed): each of them is usually a little stone with six sides. According to a contemporary great master of the Bektashi order, Bedri Noyan (d. 1997), these two grains symbolise the love for the imams Hasan and Husayn. Two major ideas in Bektashi teaching are symbolised by the teslim tas. The first one deals with the zair-batin paradigm. The zair — which represents the open side of Islam and its precepts and commandments, incarnated in the personality of Muhammad — corresponds to the outer face of the teslim tas. On the contrary, the inner face of the stone is dedicated to the bátin, that is the secret dimension of Islam. — each of them bringing a deeper understanding of Islam than the previous one. From a manuscript entitled “Evrad-i Abdalan” in the possession of Noyan, the large section) of the teslim tas string refers to the skin of the animal sacrificed by Abraham in lieu of Ismáel, as well as the one of Nesimi Sultán who was condemned to have his skin removed. Moreover, the thin section of the string is compared to the cotton rope used to hang Mansur al-Hallaj. The deaths of these two laffer Sufi figures were interpreted as voluntary or spiritual, that is experienced by the candidate during the Bektashi initiation ritual: this ceremonial occurred at a place called “dar” in the Bektashi hall which is a symbolic gallows where Mansur al-Hallaj was hung (a big teslim tas is usually present at this place). There are many poems that remind us of this moment — the climax in the Bektashi ritual. 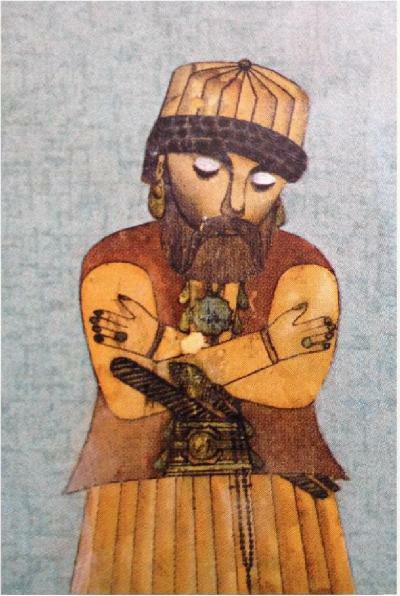 The teslim tas is depicted as an “autonomous symbol” by a contemporary Bektashi author. The explanation for this is not easy. My idea is that this stone is different from the symbols that are intimately linked to the ritual, such as the belt (Wend) or the headgear (kuláh); both symbols are transmitted only through a particular ceremonial. For this reason, the teslim tas was and is still sold at Hambektas by the dervishes themselves to the sympathisers of the brotherhoods and can also be offered by the heads of the order to their distinguished guests. On the contrary, neither the belt nor the headgear can be offered to a non-initiate. However, the teslim tas is no less sacred than these two objects. The teslim tas is nevertheless present in the Bektashi ceremonial, though not systematically. For example, we do know that sometimes a big teslim tas, was placed on a low reading desk near a sofa) dedicated to a dignitary of the lodge. Besides, in the centre of the ceremonial hall there is a stone called mey-dan tasi (stone of the hall) of about 20-25 m in diameter, which is either a square or has the form of a teslim tas with eight or twelve corners. (This place is the same as the dár al-Mansur where the initiate is symbolically sacrificed.) On top of this stone is sometimes another oval stone called kanaat tas (stone of contentment). It is obvious that there are different versions in the Bektashi ritual conceming the shape and the name of the meydan tas. In addition, on occasions of ceremony, a lighted candle stands on it. The legend attached to this stone is the same as that of the pálhang in terms of suppressing the cravings of hunger. The teslim tas is usually only worn by the dignitaries of the order. However, it must also be presented to the initiate during the ritual. At this moment, two verses from the Quran as well as prayers are read. Some verses deal with Moses and the twelve springs (2:60), while others argue that there is no fright in people close to God (10:62). Therefore, the shaikh holds the teslim tas with his two hands and puts it around the neck of the dervish. The more widespread prayers read at this occasion regard the submission to God and to the voluntary sacrifice of the initiate: “The rule of conduct of the Perfect have become my faith, no doubt now exists in my heart about putting on the teslim [tas] I have given myself to the Thee”. In the course of time, the sacred stones worn by Qalandar and Bektashi dervishes have undergone many changes. At the beginning a symbol of asceticism and austerity, the stone has become a polysemic symbol hinting at mythical, gnostic, and Sufi ideas. But it has also been a stone used for divination and healing (especially the pálhang), similar to the rain stone in the shamanic Turkic world. It appears that there is a close link between the stone and the belt, since they are two objects physically associated and frequently considered to be only one object in the girding ritual of Qalandariyya and Bektashism. Hence, this is the substitution of the belt for the stone with the word pálhang… and a continuing confusion. The pálhang as a stone put upon the stomach, however, is quite different from the stone suspended from the neck. The first one is a symbol of asceticism while the second one is a symbolic conservatory of many Sufi beliefs and practices.